St Johnstone FC host a Show Racism the Red Card educational seminar at McDiarmid Park for the second time this season as part of an ongoing partnership which also includes Perth & Kinross Council. Children from two Perthshire primary schools met St Johnstone players at McDiarmid Park today (Monday 1 March) as part of the local Show Racism the Red Card campaign. The children from North Muirton and Ruthvenfield Primaries were given a chance to ask questions of the St Johnstone players Peter MacDonald and Stuart McCaffrey and also get their autographs. 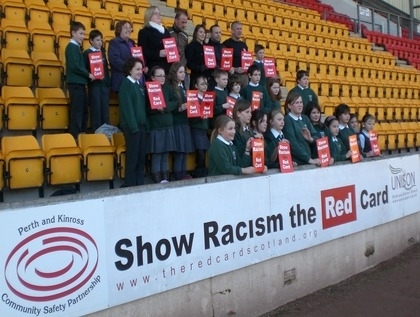 The event was part of Perth & Kinross Council’s ongoing partnership with Show Racism the Red Card and St Johnstone to promote an anti-racist message to schoolchildren across Perth & Kinross. During March, funding from the Council and the Community Safety Partnership will provide a series of coaching and educational workshops for primary schoolchildren across the area, given by St Johnstone community coaches under the Show Racism the Red Card banner. Each child taking part will receive a St Johnstone Show Racism the Red Card squad poster and a Red Card magazine. Billy Singh, Campaign Manager for Show Racism The Red Card, added: “The partnership working that Perth & Kinross Council is undertaking with St Johnstone and ourselves demonstrates a clear commitment to stamping out racism in the region. This kind of work equips young people well to deal with racist attitudes and behaviours. Schools in the area are very keen to engage with the campaign and the young people we have worked with are very positive about it." Also joining in with today's proceedings were ex-professional footballers and Show Racism the Red Card coaches Gary MacKay and Michael Weir. This event was supported by UNISON Scotland. Show Racism the Red Card would like to thank all those that made this such an enjoyable and engaging day, extra thanks are due to the pupils of Muirton Primary School and Ruthven Field Primary School.